Specializing in underground concrete structure restorations and located in Oregon’s Willamette Valley we serve the entire Pacific Northwest. Underground Technology is your leading provider for repairing concrete or brick manholes, lift stations, vaults and waste water treatment plant structures. We take great pride in providing efficient professional service and are a certified applicator of Madewell products. – The rehabilitation process begins with preparing and cleaning the surface of the structure, usually by means of high pressure water. – After cleaning, active leaks are stopped, specially designed mortar is applied using a shot-crete nozzle or centrifugally using the Mainstay Mortar Spinner. – While the mortar is still soft, epoxy is applied. The simultaneous applications of the mortar and epoxy results in a monolithic bond that is extremely resistant to corrosion. The pipe lining process provided the process of lining large diameter culverts and pipes with out the need of entry. – There is no wait time for the mortar to cure after it is applied to the manhole because the epoxy topcoat is applied while the mortar is still soft. Therefore, the manhole rehab system can be installed quickly, and deteriorated manholes and other structures can be repaired and put back into service in a single day. This reduces labor costs and saves time. The need to mobilize twice is also eliminated due to the concurrent application of the cement mortar and epoxy coating. – This system is also specifically designed for use in moisture laden environments. 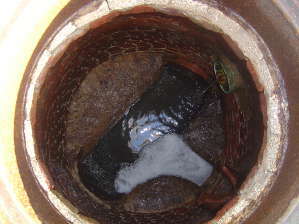 Surfaces in manholes and lift stations are often continuously damp, making it nearly impossible to apply a protective coating alone. Cementitious products used in the Mainstay Composite Liner are properly applied when the surface of the concrete or brick manhole remains damp, eliminating the tedious task of drying the substrate prior to application. – One main component of the Mainstay Composite Liner is Mainstay ML-72 Sprayable Microsilica Restoration Mortar. 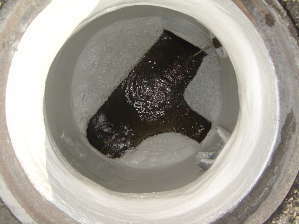 It is a high-build restoration mortar that can be applied to vertical manhole surfaces up to 5″ thick, often restoring the manhole substrate to its original thickness. The cured mortar has a compressive strength of 10,000 psi, resulting in a restored manhole that is stronger than the original structure. – Mainstay DS-4 and DS-5 are 100% solids epoxy coatings. These highly corrosion resistant coatings contain no solvents and may be applied to the manhole up to .125″ (125 mils) in a single coat. WANT TO KNOW MORE ABOUT OUR SERVICES? SEND US A MESSAGE.